Totara Latina 2 may be the upcoming event you’re looking for. 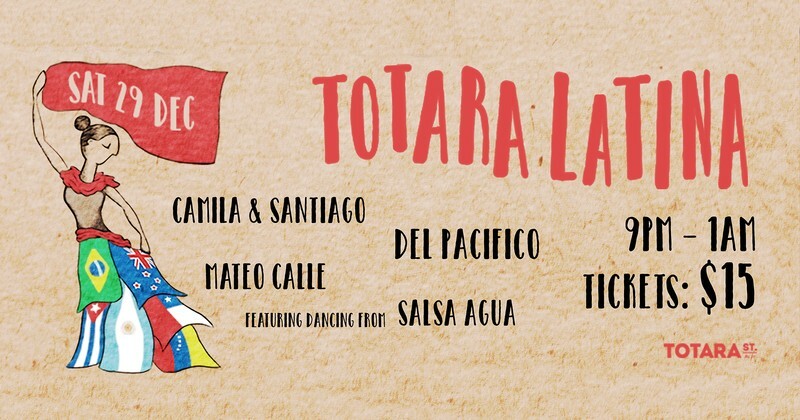 Del Pacifico presents Totara Latina. A fiery night of music and dance. Don't miss the biggest Latin Party of the summer, featuring 10 piece band Del Pacifico rocking famous tunes from all over South America. Camila & Santiago will jam groovy tunes as the opener, and Mateo Calle will keep the fire burning into the night. Special guests Salsa Agua will be dancing to the Latin rhythms, sure to excite and delight the crowd.